Apple has been repeatedly rumored to be developing a form of smart glasses or a headset that can offer an AR or VR experience. Reports dating back to November 2017 advise of a project codenamed "T288," with supposed features for the hardware including the use of 8K-resolution displays for each eye, a processor faster than any Apple currently produces in its released products, and using WiGig to wirelessly communicate with a host device. While rumors point towards the potential specifications of the hardware, a pair of patent applications published by the U.S. Patent and Trademark Office on Thursday indicate Apple is working to solve problems connected to the rumored hardware. One relates to user comfort, the other for protecting the components from damage. The first patent application, a "head-mounted display with adjustment mechanism," describes how a headset could be mounted to a user's head, and improvements to the ways it could be adjusted. Taking the form of a ski goggle-style headset that goes around the head, but without the band for over the head as used by existing VR headsets, the patent application is more about how to tension the band to keep the headset firmly in place. A second version involves a gear rack, which is used for similar tightening and loosening purposes. A third method involves the use of a fixed headset frame that is lined with pneumatic bladders. Once on the head, the bladders inflate, trapping the headset on the user's head with cushioning. 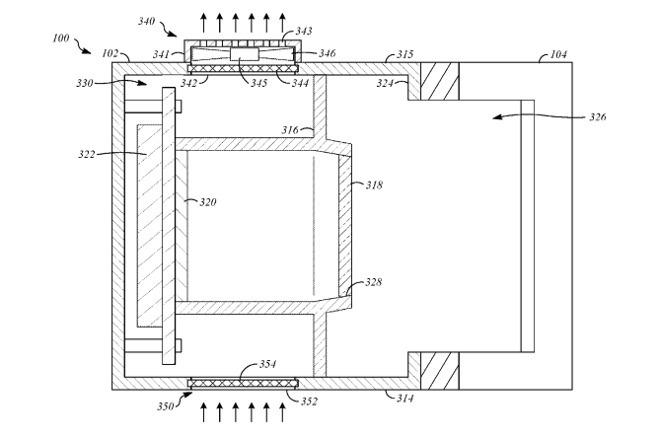 In all cases, Apple also suggests the system could employ eye tracking to monitor the distance between the lenses and the display assembly and the user's eyes. 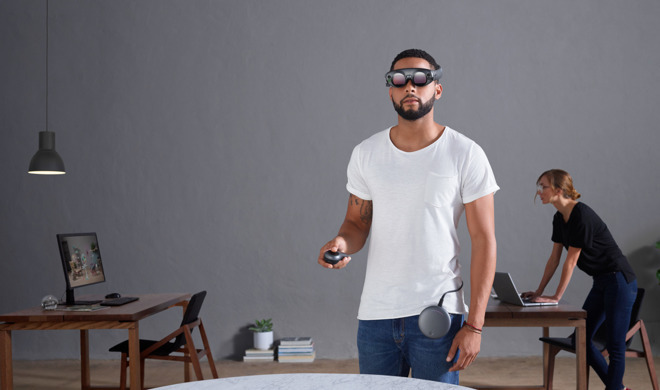 This would be able to help detect the relative motion of the headset to the eyes, which would not only help the software produce a more accurate visual experience when in motion, but also could tell the headset if it is fitted tight enough to the user's head. The other patent application, "thermal regulation for head-mounted display," is relatively self-explanatory. Due to the potential for displays and computing hardware to warm up over time, such as with normal computers and notebooks, it would be expected that a VR or AR headset would do the same. Apple's solution is simple, in that it effectively uses a fan to push air through the chamber of the headset where the components are located. Multiple fans can be used to push and pull air through different sections of the component chamber. While fans blowing onto a user's eyes could cause irritation, the application suggests the possibility for air to pass from the eye chamber of the headset into the component chamber, with air entering the eye chamber either through vents or via the face seal, if it is made of permeable material like sponge or foam. Pulling air out from the eye chamber could also offer benefits to the user, like making the headset cooler to wear, making it easier to use for longer periods. It is suggested the fans could be controlled by a number of elements, including the temperature of components, humidity in the eye chamber, the user's skin temperature, and even the level of perspiration. As usual with patent applications, Apple makes numerous filings every week, and while they do suggest areas of Apple's interest, it isn't a guarantee that the ideas will make their way into commercial products and services. Apple does have a number of existing patents for AR and VR hardware, covering topics such as eye tracking and partial display updates, and is widely believed to be working on some sort of product in that field. It is also suggested that it could take the form of smart glasses, a lighter form of AR goggles, though such wearable items aren't expected by analysts to be released by Apple until 2021 at the earliest. LOL. No. An AR device that doesn’t look and feel like glasses is doomed to fail. VR goggles are even more doomed. The AR/VR ski mask is a red herring, the eye-tracking is the real patent. 4K with HDR, AR apps,games,video editing. What else do you need? What do iPhones have to do with AR glasses? Anything that is the size of strap-on goggles for AR will fail imo. It has to be the size of bulky shades or glasses at best. I see a lot of potential with AR glasses or a product category that goes into Apple’s wheelhouse. VR glasses? That’ll be even more niche and mostly for games, and Apple and games don’t work together. With AR, there is a blue sky, open ocean of UI stuff that is going to happen there. So Apple should be racing to it. AR glasses would still be a smaller niche than phones, probably smaller than PCs or a subset of that, Macs or iPads. People just don’t want to wear glasses, but still, Apple should be racing towards it as the UI for AR is a huge open ocean of things that you can do. About 30% of people have very weak stereoscopic vision preventing depth perception when watching 3D TV based on stereo disparity. (Citation: wikipedia on 3D TV.) This is probably what killed 3D TV, not to mention that a good chunk of people found 3D gave them eyestrain, headaches, motion sickness or even seizures. (When I myself put on a 3D TV headset in my local store I felt unpleasant eye strain within seconds.) But Augmented Reality isn't as visually immersive so it's less likely to cause these problems, but it won't be free of health problems. And since 20% of teenagers and 60% of people overall wear prescription lenses, that's going to complicate Augmented Reality too. I don't hope AR will fail, but maybe the simple/cheap 2D display screen will win out in the end. And that's not so bad, because you can simulate 3D on a 2D screen by moving your mouse to navigate in a virtual 3D world. I've been doing that since 1981 when the first PC 3D game came out and it works just fine, thank you very much. Most normal people will not be caught dead wearing big, heavy goofy-looking headsets.The future is AR enhanced smart contact lenses. I am almost certain Apple would never introduce big, heavy goofy-looking headsets. I think they are just throwing that in the patent for show as to not reveal the real look. As a PSVR owner I always find the comments on these threads entertaining. VR is already incredible as a first gen console product, I absolutely cannot wait to see what the next gen brings. It’s pretty easy to tell who here hasn’t really used VR. AR is a different beast and I suspect we’re further away from a public wearable in that realm. It’s important to differentiate what you’re talking about between these two techs. The fan thing outlined here is for dealing with lens fogging, which happens with sealed VR headsets. Generally with the PSVR it goes away after it’s been on for several minutes and has heated up, but can remain for some users. Apple is clearly exploring ways to deal with this issue. This does not apply to a non-sealed headset or AR “glasses”. A "Shoebox on Your Forehead". Nice. But unless the entire design department has been let go, they probably have a sleeker design on the boards. So the implementation is different, then? Isn't that what patents are awarded for? Apple will connect two homepods together and strap them to your face. Fanboys will go wild.